MEN'S SILVER CUFF BRACELETS : LOVE2HAVE in the UK! The Best! 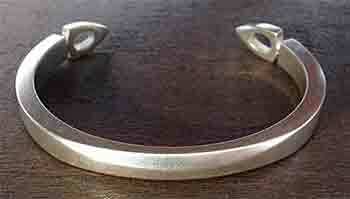 British made men's silver cuff bracelets all handmade in the UK at prices you can afford. We are independent experts in silver torc or cuff bracelets for men and learnt very quickly after we first started featuring this type of jewellery over ten years ago that comfort and fit are of paramount importance. When it comes to fit, these silver bracelets need to feel smooth on the wrist. They also need to be secure, so won’t fall off once slipped on, and they need to be the correct size so as not to feel too tight. All our designs tick all the boxes on the points mentioned above, and we can tell you what size in internal diameter you will require regarding your wrist size. On average our bracelets fit 7 to 8-inch wrists, and they can all be adapted if need be, but please do email us first if you are not sure. As you can see we sell something to suit everyone, from unique oxidised pieces to the more understated and cleaner styles all made from solid 925 sterling silver.